a recipe for cooking chicken breasts with potatoes in the mattone. Terra-cotta mattones are difficult to find. 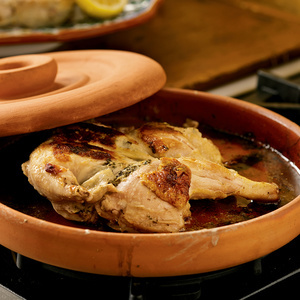 You can use clean, foil-covered bricks, a heayy cast iron skillet or a panini press lid as a weight for the the chicken. Split chicken by splitting along backbone with poultry shears. Open the carcass like a book. Turn it bone-side down and crush the backbone with your hands. Pull each leg until it pops out of its socket. Press chicken with your hands, flattening it to a uniform thickness. Coat both sides of the chicken with olive oil. Rub all over with the herbs, salt, and pepper. Baste with some of the lemon juice. Preheat the mattone over medium heat for 5 minutes. Place 1/2 cup of olive oil in the base of the mattone and heat for 2 minutes. Place seasoned chicken, skin side down, in the base of the mattone. Cover with press (lid). Cook over medium heat until the skin is evenly golden brown, about 10-15 minutes. Reduce the heat if the skin is browning too quickly. 10-15 minutes. The basting is very important to prevent the bird from drying out. Turn the chicken over one more time, press, and cook about 5-8 minutes more. The chicken is done when the juices from the thigh are clear when pierced with a fork. Transfer the chicken to a cutting board and allow it to rest about 5 minutes. Cut the chicken into 4 pieces. Garnish with lemon wedges, olive oil, and a sprinkling of salt. Cut the breastbone of the chicken breast with poultry shears. Do not cut the breast into 2 pieces, just cut the bone. Open the breast like a book. Loosen the skin on each breast half and insert a rosemary spring. Coat the chicken breast with olive oil and season with salt and pepper. Cut the potatoes into 1/2-inch slices. Cook the potatoes in boiling water for 5-6 minutes, drain. The potatoes are partially cooked and will cook further in the mattone. Place the potatoes and lemon slices in a bowl. Drizzle with olive oil and season with salt and pepper. Gently toss to coat the potatoes without breaking them. Preheat the mattone over medium heat for 5 minutes. Place 1/2 cup olive oil in the base of the mattone, and heat for 2 minutes. Place seasoned chicken, skin side down, in the base of the mattone. Place sliced (pre-cooked) potatoes and lemon slices around the chicken. Cover with press (lid). Cook over medium heat until the skin is evenly golden brown, about 6-7 minutes. Turn the chicken over, and turn the potatoes and lemons over. Cover with the press and cook for another 6-7 minutes. Reduce the heat if the skin is browning too quickly. Chicken is done when the juices are clear when pierced with a fork. Transfer the chicken to a cutting board and allow to rest for 5 minutes. Slice the chicken and serve with the potatoes and lemons. Good quality, stainless-steel shears are a kitchen essential. They come in handy for cutting up chicken, trimming pie dough, cutting parchment paper for baking, cutting pizza or pita bread, or snipping herbs. This two-piece set comes with a 12" cast iron griddle pan and an 11" ceramic press. For juicy, crispy chicken, the ultra glazed ceramic press retains moisture and enhances browning. On its own, the griddle pan is ideal for making eggs, bacon, and pancakes. Its textured black matte enamel interior ensures perfect frying and even cooking every time.